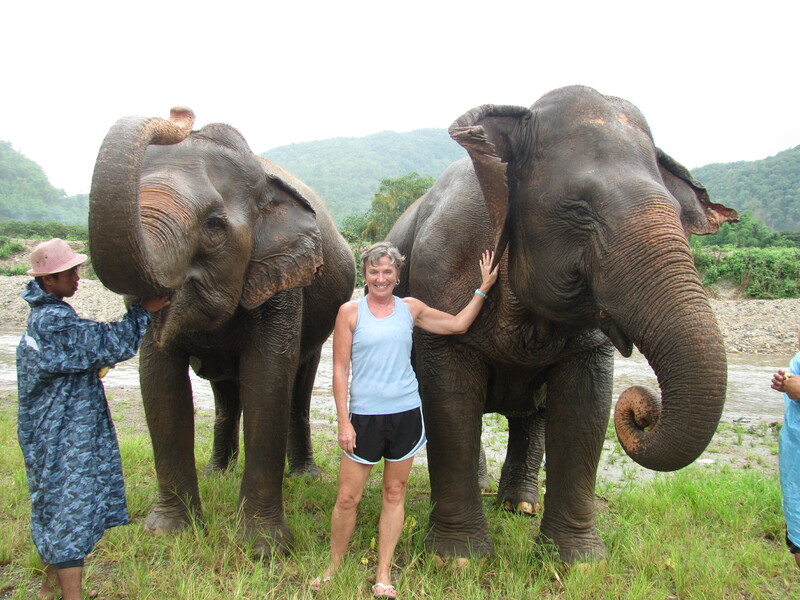 Fortunately, I was able to escape from Singapore and the Sumatran smoke and head north to Thailand. By the time I left late last week, the air quality had reached hazardous and the smoke had pretty much permeated everything – my apartment, the trains, all clothes, everything! My head hurt, my lungs were burning and my stomach was even upset. You can’t really describe it with numbers or even photos. They don’t capture the brownish tinge, the smell of the burning wood and peat, and the fact that it was still 90+ degrees, even though the sun had no hope of peaking through. It actually got worse after I left and I am not sure I would have coped very well at all. There is scarring in one of my lungs from some very bad post-surgical pneumonia and I had some very unhappy airways. It is better now but still classified as unhealthy and still forcing all of us fitness fans into the gym. The fires are still burning strongly and the boggy earth is actually on fire. The smoke has just been blowing to Malaysia due to an unusual wind shift over the past few days. A few thunderstorms have helped here and in Malaysia. Unfortunately, the wind is forecast to shift back to its normal direction which may blow it all back here. 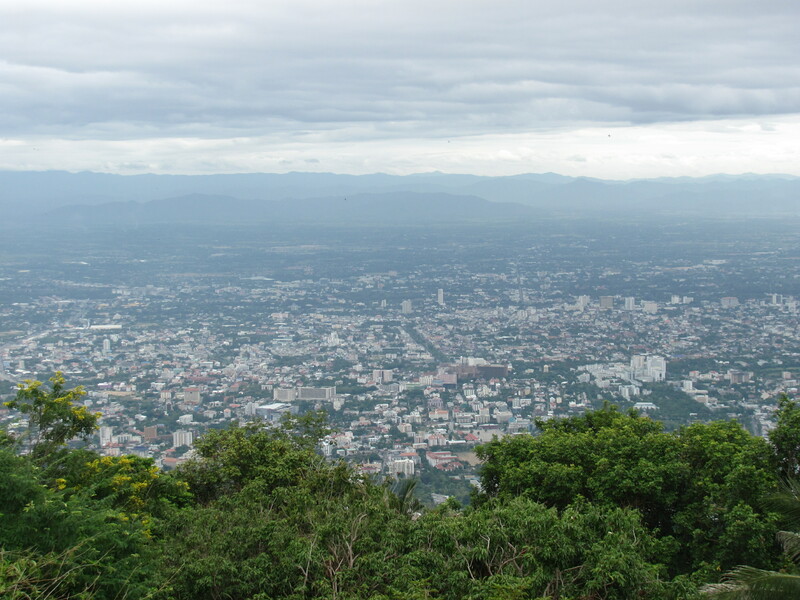 I went to Chiang Mai, Thailand’s second largest city, in the hills and jungle of northern Thailand. I opted for Chiang Mai because it isn’t a big city (I have been immersed in one for almost 6 months) but there is a lot to do and see. Plus, it is north of here and cooler and smoke-free. 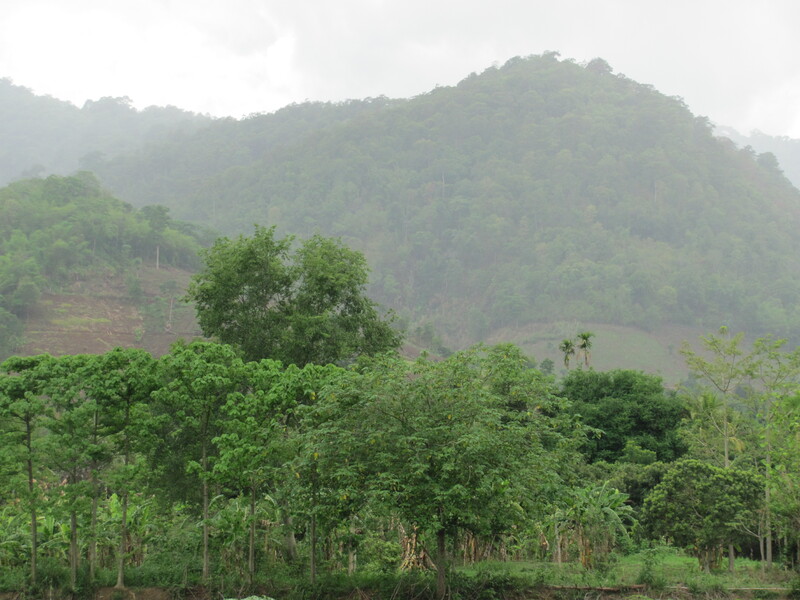 It is not far from the Cambodia, Laos and Myanmar borders and the local hill tribes are famous for beautiful crafts. 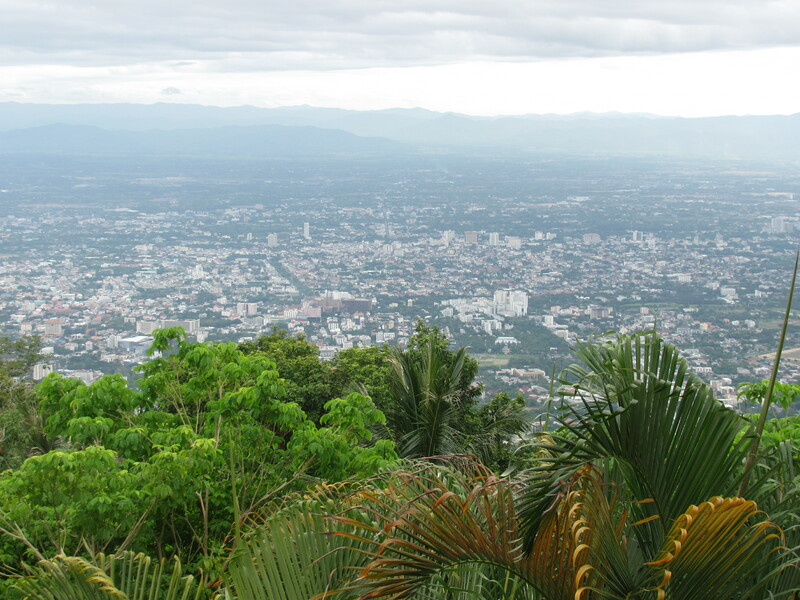 Chiang Mai is home to about 300 wats (temples) and a hub for Thai cooking schools. 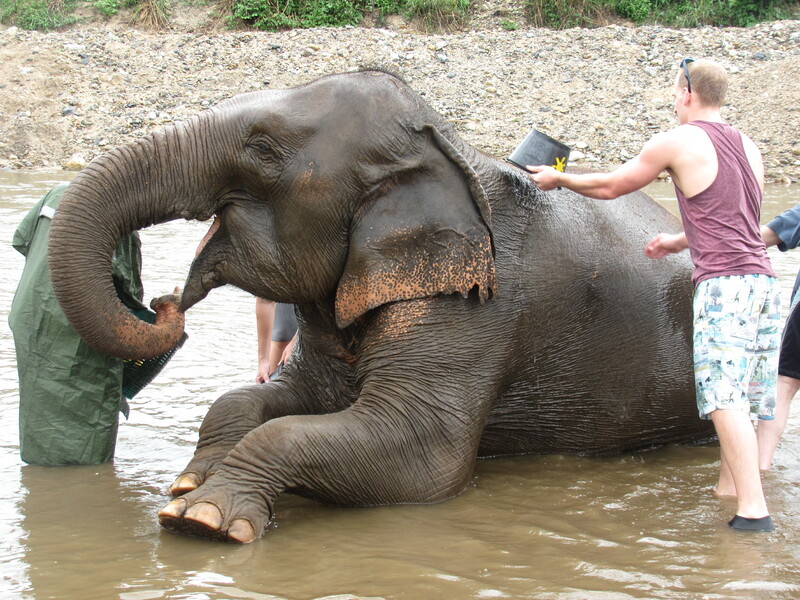 In addition, many of the elephant camps and conservation centers are in the region. But most of all, it is very Thai and the home of some of the most gracious and engaging people I have meet in this part of the world. Here are some views of the area from the hills outside of town. I have to sort through all of my wat and market photos before I can make sense of them, so I decided to put them in a separate post. 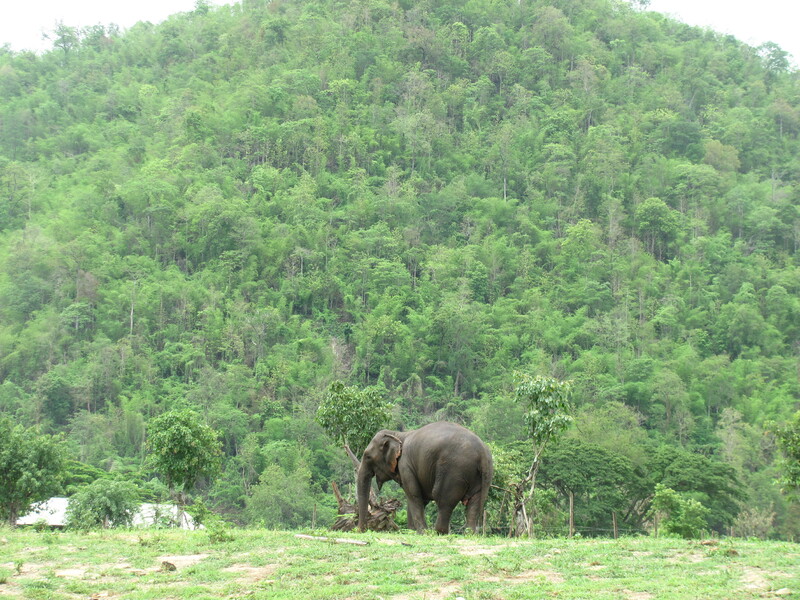 The photos I am attaching below are from my day at the Elephant Nature Park which is devoted to conservation efforts. 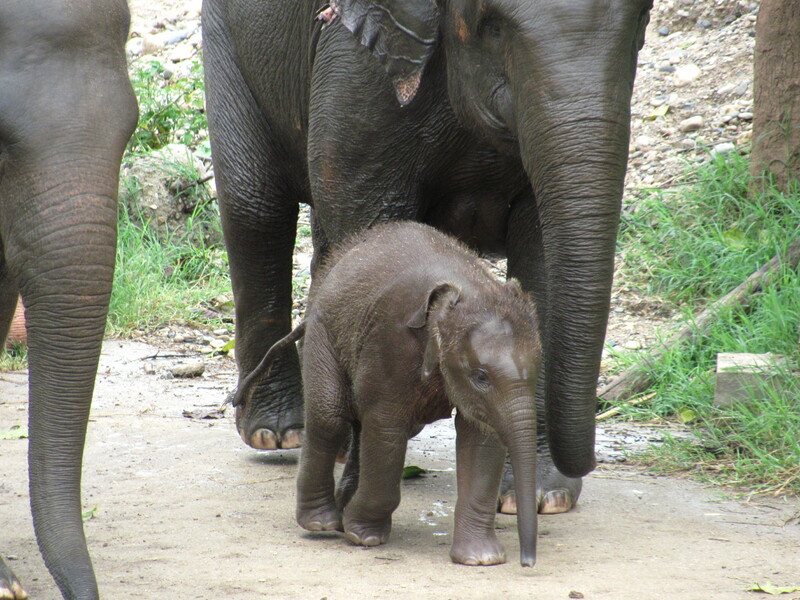 Thai elephants have dwindled to less that 10% of their previous population. I think there are only about 5000 left. They are revered in Thai tradition as you will see in my wat photos, but they have often been abused for commercial purposes. 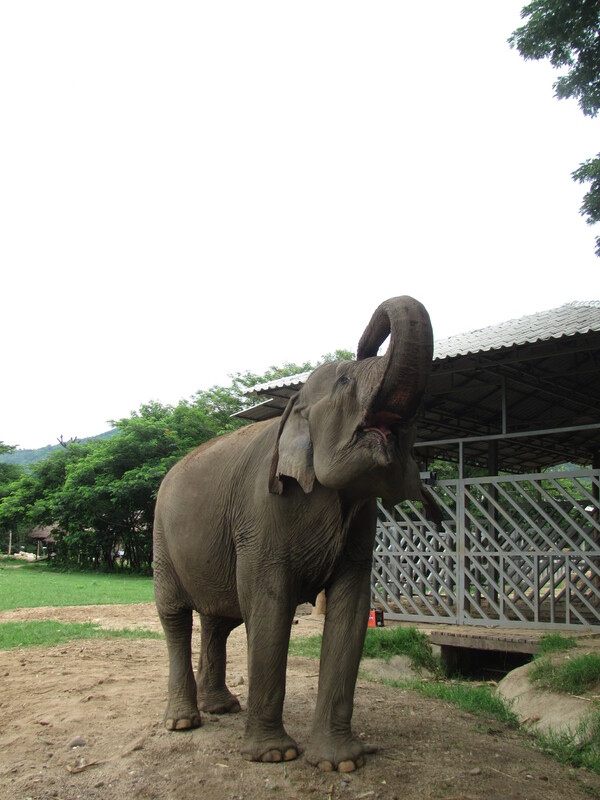 Most of the 30 0r so elephants at the center have been rescued from street begging, logging operations and the tourist trade. They live here in herds as close as possible to natural conditions. 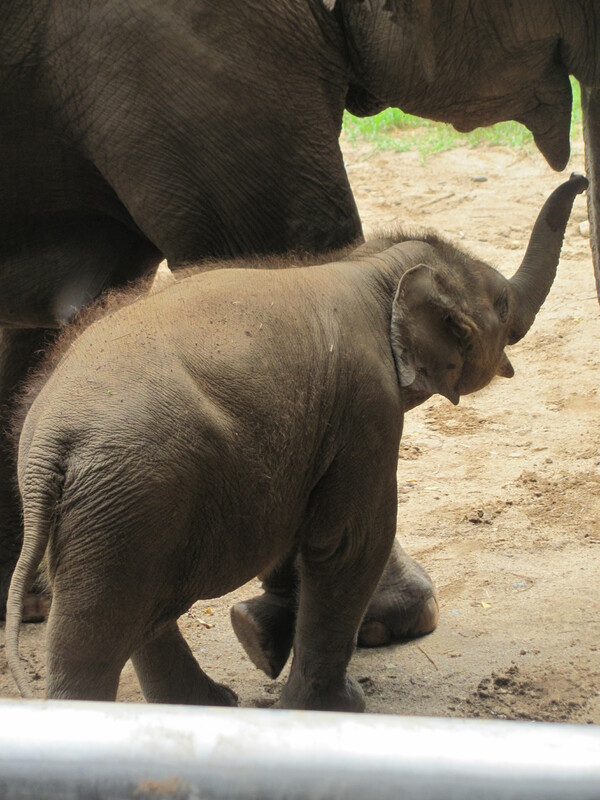 Except for the 3 or 4 that have been born at the park and a few lucky ones, they have permanent injuries ranging from blindness to poorly healed broken legs, hips and spines. 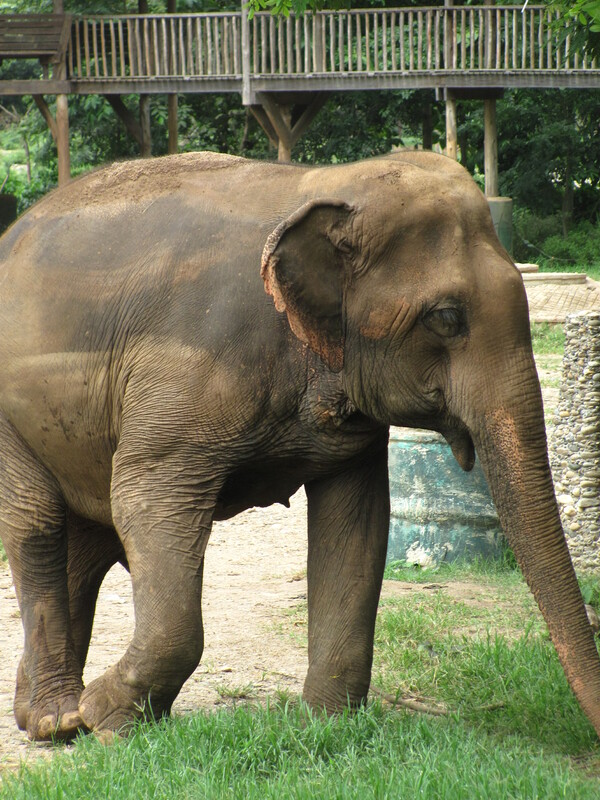 Asian elephants are much smaller that African elephants and the practice of putting 2 large (as our guide Sai kindly said) Westerners in those chairs in the middle of their backs can hurt them. 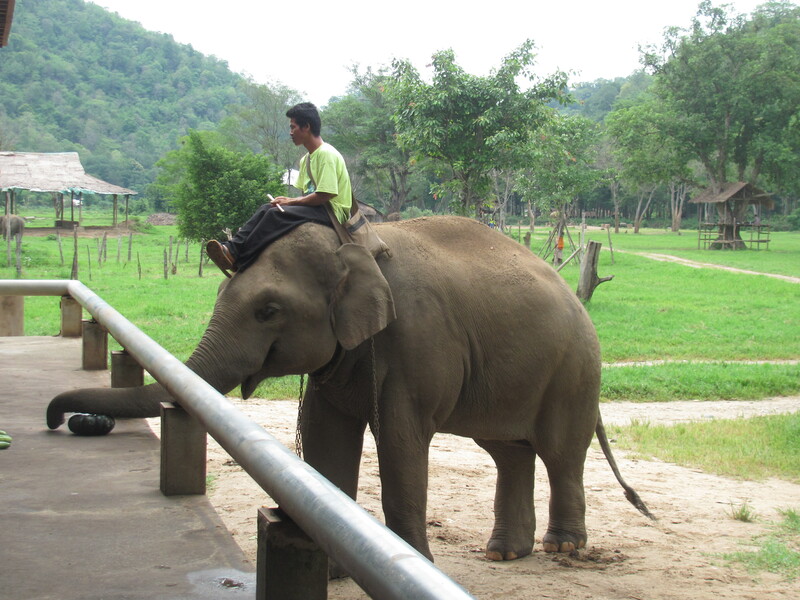 Thais are small people and the elephants have no problem and often enjoy carrying their mahouts (sort of a combination of trainer and buddy) on their necks, but they are not SUV size vehicles. 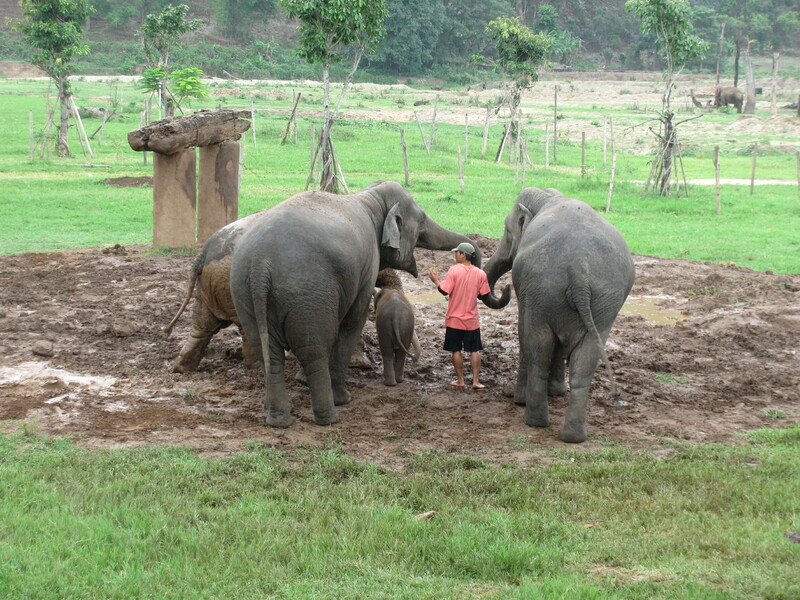 I will not go into the traditional practice used to “tame” the young elephants for domestic use, but it is brutal and centuries old. Many are injured in the process and often suffer emotional scars that last forever. 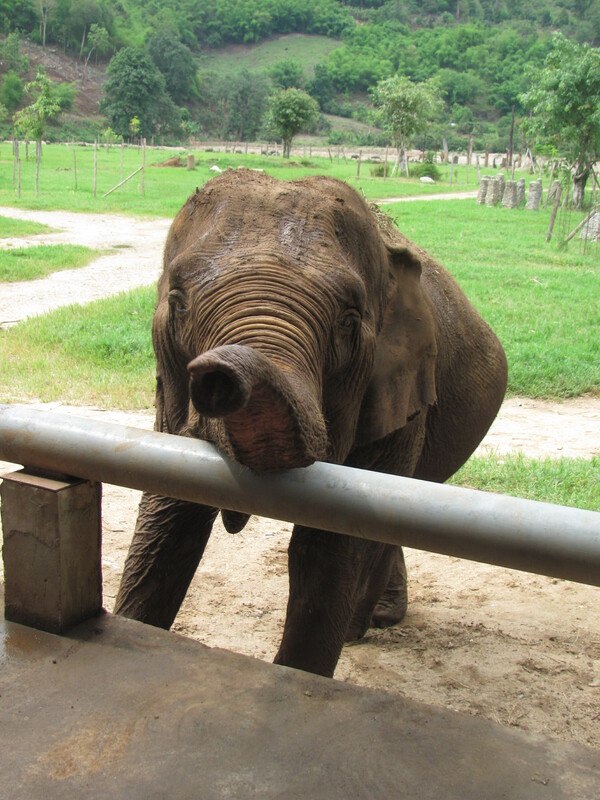 The blindness that was so prevalent in the elephants we saw is sometimes intentional because the elephant’s skin is so thick it is difficult to make them feel pain by poking it. In other cases, it is due to cataracts formed by bright flashes at tourist shows and circuses and it seems to be something they are prone to. No flash photography is permitted at the park for this reason. 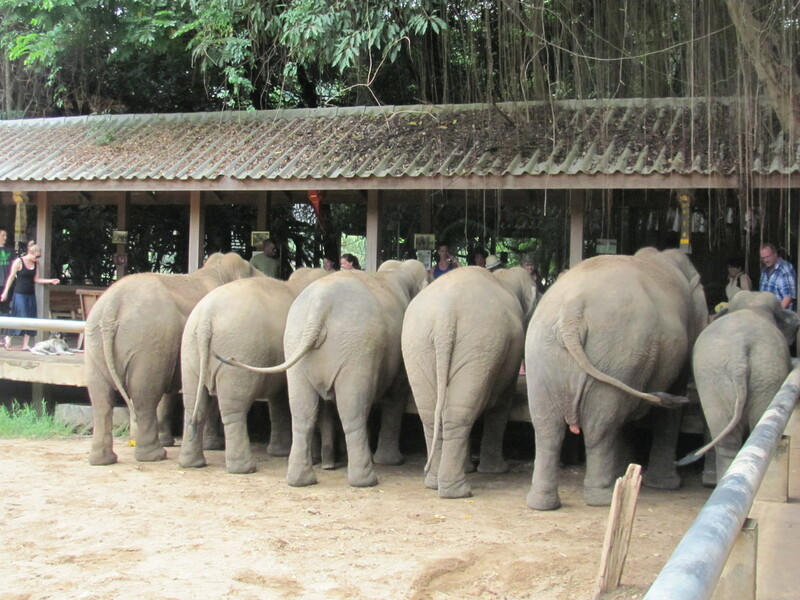 Most of the elephants in the photos are female since it is a matriarchal society and the males are kept away from the herds as they are in nature. 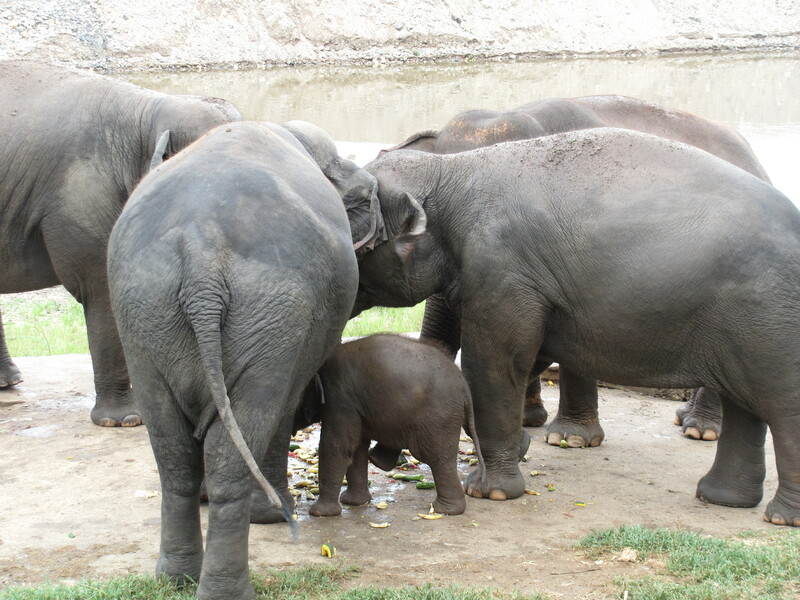 The baby you will see is about 7 months old and is always protected by her “nannies”. She is just learning to eat food. 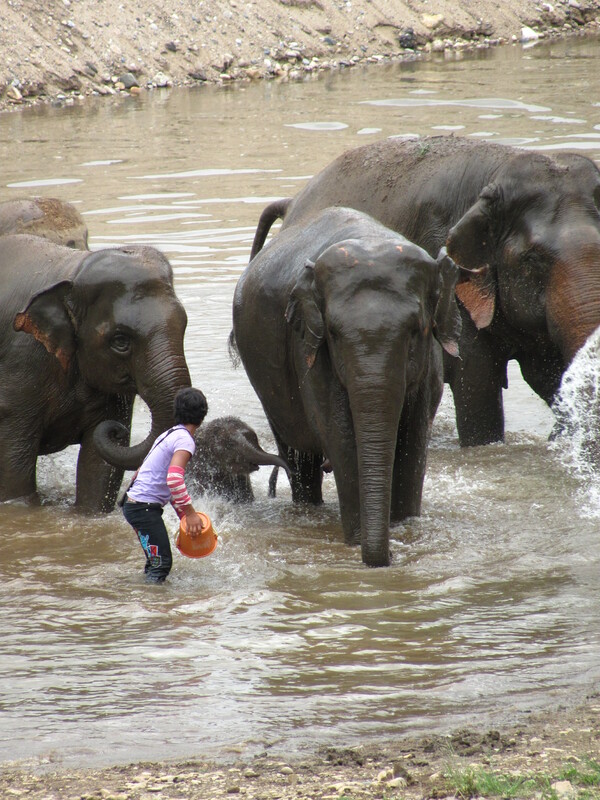 You really are right there with these elephants, feeding them, bathing them ( although they go right to the mud pit after bath time to coat themselves with mud, their version of sunscreen and bug repellant) and walking around with them, except when the baby is around. It is an amazing experience and a very long day!! You can actually stay at the camp as a volunteer for weeks or months if you choose. 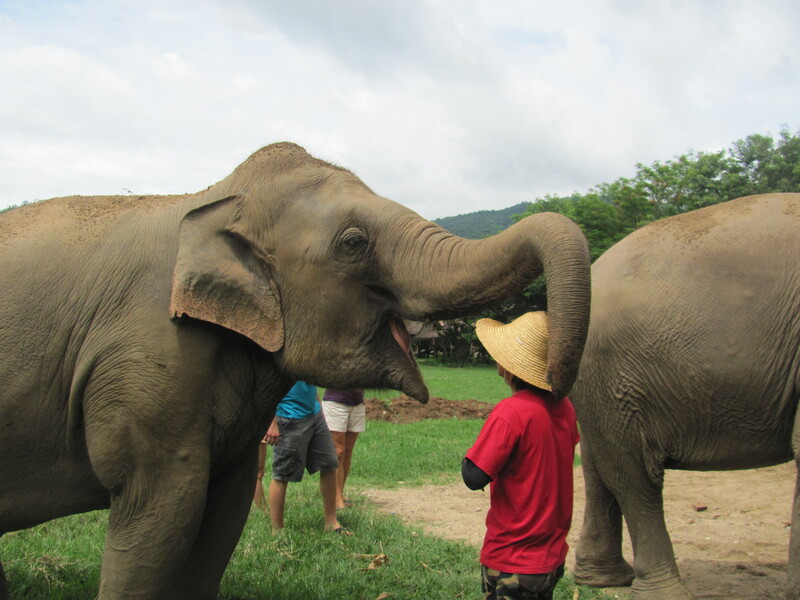 Sai, our guide, said that it made his heart feel good every day because the elephants are happy! 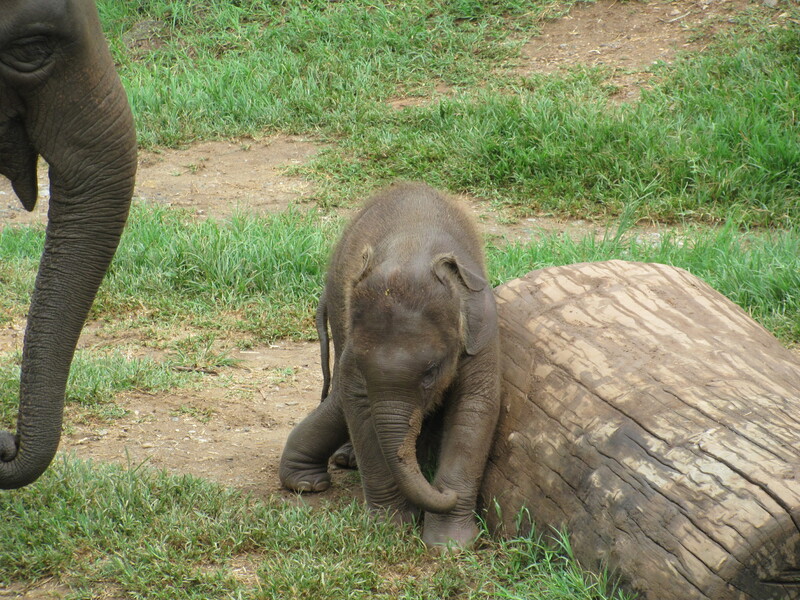 So here are elephant photos and I will save the wats for another day!